October 25, 2016, 6:03 p.m. The release of John Podesta&apos;s emails has proven embarrassing for the Hillary Clinton campaign, particularly the revelation of the contents of her secret speeches to banks and her aides&apos; strategizing over her own e-mail scandal, among other issues. Thanks to ongoing controversies surrounding Donald Trump, Clinton has largely managed to avoid having to engage with the issue, but reports from intelligence agencies suggest that the leaks may have a broader, geopolitical relevance: Russian intelligence services are suspected of being behind the hacking of Podesta&apos;s email account. YouGov&apos;s latest research shows that public attitudes towards Wikileaks is very different in 2016 compared to 2010. According to Pew Research Center, in 2010 60% of Americans who are aware of the emails thought that the release of State Department cables harmed the public interest, but in 2016 only 28% believe that the release of John Podesta&apos;s emails harms the public interest. The shift is most pronounced among Republicans, 75% of whom say that the cable releases were harmful, while only 12% say that the email leak is harmful. Among Democrats the change is minimal. 53% who had heard of the cable leaks thought it harmed the public interest, while 48% say that the email leak in 2016 harms the public interest. The American intelligence community has widely agreed that Russia is, in some way, behind the hacking of John Podesta&apos;s emails. Few Americans are convinced by this, however. Only 33% of Americans believe that Russia was behind the leaks. 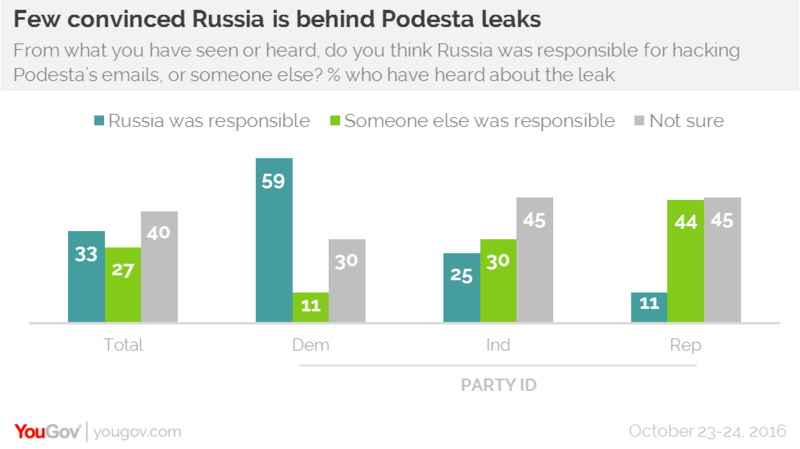 Most Democrats (59%) believe that the Russians were behind the leak, while only 11% of Republicans agree.